Edaville USA is a family park located in south-eastern Massachusetts, a little under sixty miles from Boston. Shortly before our arrival we noticed a prominent road sign saying "your GPS is wrong; take next right", making us wonder just how many park visitors had inadvertently pulled into a private driveway over the years. I'm glad to say that I've always considered the instructions from satellite navigation to be guidance rather than orders to be followed blindly, and thus far I've managed to avoid driving into rivers and off the edge of cliffs. We were greeted within moments of stepping out of our car by a bubbly member of staff who handed us a map and told us to have a great day at Edaville. This first interaction, simple as it was, set the tone for our visit; everyone we spoke to over the course of our stay was friendly and enthusiastic, and we were having such a good time that we ended up staying over three hours in a park that we'd fully expected to be a quick hit. Though presently geared at children the park is taking tentative steps towards bigger rides with the upcoming installation of Kersplash, a water coaster that operated for seventeen years at the Washington State Fair. We also saw the foundations for a go-kart track, as well as construction signs for Pirate Adventure which online reports suggest will be a dark ride. The main entrance is through an archway that leads to what can be thought of as an ultra-minimalist version of Universal CityWalk. One side features a selection of craft shops selling locally produced goods, while the other is devoted to information boards talking about the park and its history. Our first stop once through the ticket barrier was at Spinning Lady Bug Coaster (#2273), yet another example of the compact spinning coaster from SBF Rides. The four car trains featured custom bodywork consisting of black spots on a red base, but otherwise the hardware looked and felt no different to the other models. The operator thoughtfully augmented our ride with a variety of man-made sound effects, chiefly words like "woohoo!" and "yeehaw!" every time the train passed through the station. In 2015 the park became the third in the world to open an area dedicated to Thomas the Tank Engine, following in the footsteps of Drayton Manor in England and Fuji-Q Highland in Japan. The three parks have taken somewhat different approaches to the franchise, with individual ride selections reflecting their own unique markets. Edaville management decided to go with a Zamperla Speedy Coaster for their version of Troublesome Trucks Runaway Coaster (#2274), and the result is a respectable enough ride that handles well aside from a harsh chain lift engagement that, to be fair, is not exactly unusual for the product type. Our next stop was at Winston's Skyline Express, an elevated monorail ride that featured lap bar restraints despite there being a side wall in each car, a sad reflection on the fact that local children cannot be trusted to remain seated. There were quite a few good photographs available from the aerial vantage point, including some close-ups of the Kersplash construction site. We did have to wait a few minutes to board, but that wasn't a big deal; the time passed very quickly as we watched the lady in front of us attempt to control her two daughters, whom she'd apparently chosen to name Arianna and Joliet, the latter being a name that seemed more than a little improbable. The main attraction in the park is a narrow gauge railroad dating from 1947. The twenty minute loop is operated once per hour and is pulled by a full scale replica of Thomas the Tank Engine, albeit with cars that look nothing whatsoever like Annie and Clarabel. The uniformed staff gave a theatrical "all aboard" cry before dispatch, and once we were in motion an audio recording came on that pointed out key landmarks along the route. At one point someone came by and offered to take our photo, and though we declined we saw quite a few families taking advantage. The main thing that stuck with me from the journey was the sheer amount of space that the park has for future expansion; both of us felt that a Wooden Warrior clone would be a great fit! Another recent addition to the park is Dinoland, a forested area filled with animatronic dinosaurs and the tangled remains of Gnome Coaster, a once-popular ride that, according to the signage, "closed abruptly twenty-five years ago". The veracity of this statement was (and is) impossible to verify as the only online references to a coaster by this name date from the last few years. 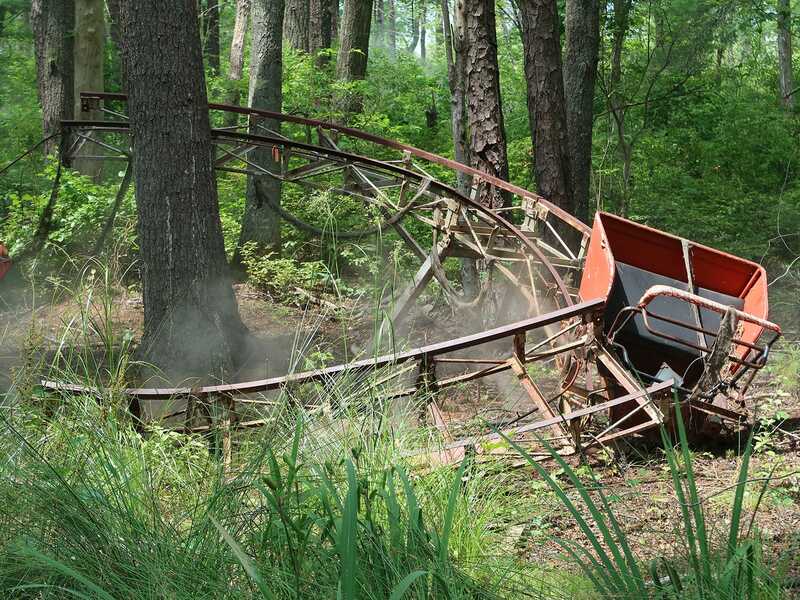 However, it is established fact that the Edaville Railroad had carnival rides in the run up to its closure at the end of 1991, so it's certainly possible that the pieces came from an old credit that nobody remembers today. 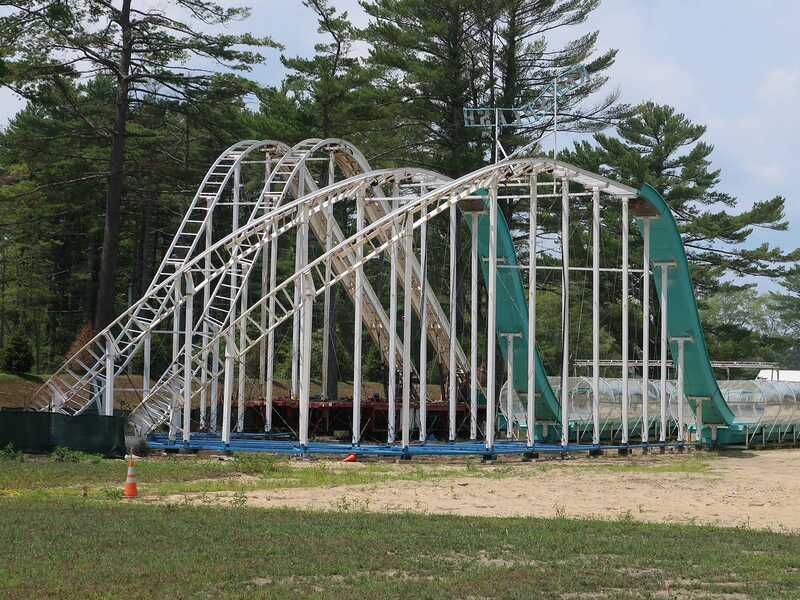 RCDB has the pieces listed as coming from the defunct Enchanted Forest in nearby Rhode Island, though whether that's correct or not is anybody's guess. It would have been rude not to make a brief stop at Big Eli: The Ferris Wheel, a vintage sideways facing model dating from 1951. As we approached the operator asked us if we'd left our kids somewhere else, and he seemed genuinely pleased when we admitted that we were visiting on our own. He spoke briefly about how the owner had put an awful lot of work into sprucing up the park and how there was lots more to come, and he encouraged us to come back in a few years if we could. The ride itself moved at a substantial speed, as is normal for Eli Bridge wheels, but we managed a few photographs nevertheless. We were on our way out the door when our eye was drawn to a sign for a Miniature Train, and we decided to follow it to a substantial building that we'd somehow managed to miss. The ground floor was devoted mainly to arcade games and shopping, but an upper floor featured a whole bunch of kiddie rides, a museum of retired farm equipment that had once been used to cultivate cranberries, a ball pit whose contents were themed to the aforementioned fruit, and a working model railway with an amusement park section at one end. We arrived at the final park of our two week adventure on a high after a wonderful morning, but we were unceremoniously brought back to earth by what can only be described as a Six Flags Day. There was a definite sense that the staff on duty today were doing everything that they could to ensure that guest experience was as miserable as possible, and we were so drained by it all that we cut our stay back to less than ninety minutes, including the walk to and from the parking lot located half a mile from the entrance. Megan had hoped to use this visit as an opportunity to finally ride Goliath, but a minor operational incident earlier in the week had left it in an advanced state of non-functionality. We did like the clear and unambiguous sign at the entrance warning that the ride was closed for the day however, its inherent honesty representing a sharp contrast to what we saw at Dollywood. 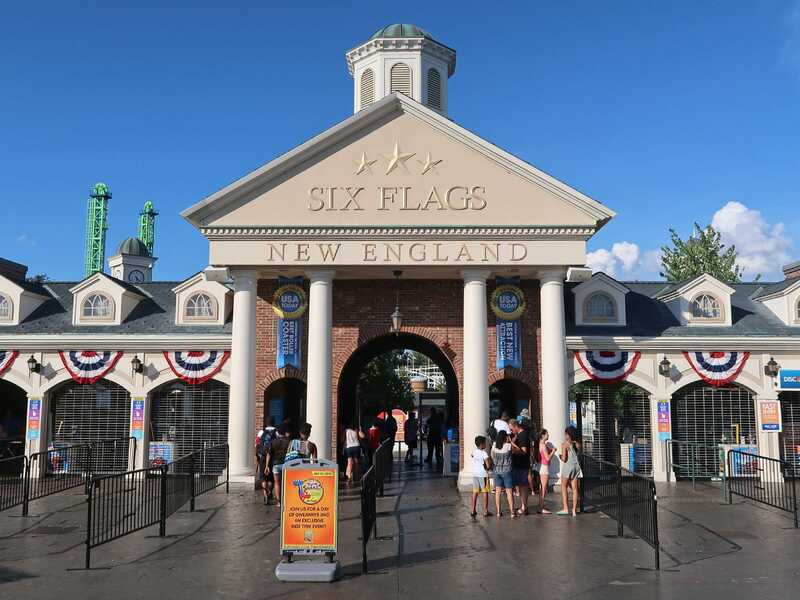 The Six Flags New England equivalent of the personal greeting we received at Edaville USA was an oversized billboard talking about the park's code of conduct, complete with dire warnings about the consequences for any perceived infractions. The tone of the language and its prominent placement felt extremely unwelcoming, representing a slap in the face even before we were inside the gate. It's possible that the park has an ongoing issue with guest behaviour, but even if it does, I'd take the view that management would do far better to investigate and remedy the root cause of the issues rather than to threaten everyone on their way in. I'd point to the recent research into increasing numbers of air rage incidents that lays much of the blame on the way passengers are treated in economy class; when people are treated poorly it's almost inevitable that a small percentage of them will crack. As we walked down the main midway we were blasted by loud pop music, in your face advertisements, and thumping basketballs that represented a sharp and thoroughly unpleasant contrast to the gentle sound of Mr Sandman that we'd heard on Edaville's midway. 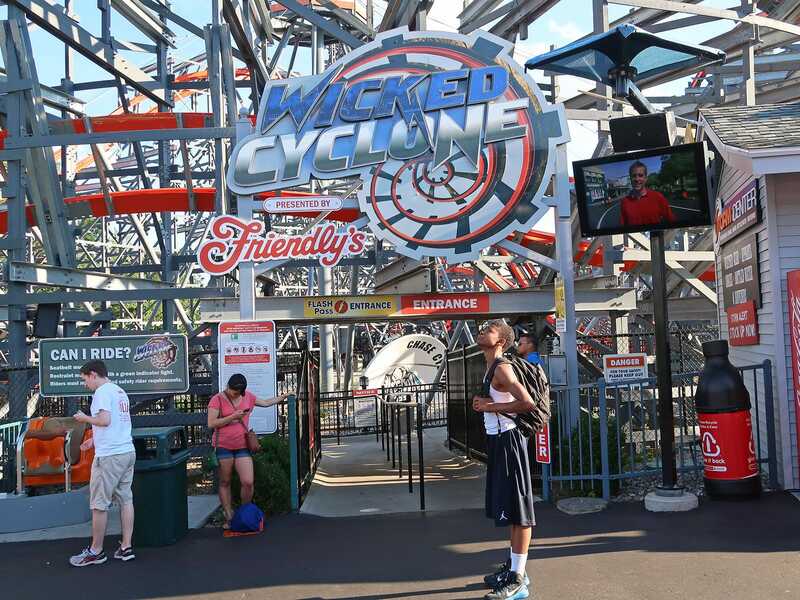 A bored-looking operator at the entrance to Wicked Cyclone (#2275) told us that we'd need to put our fanny packs in a locker before entering the queue because they were not allowed on the ride and there was no storage in the station. The prohibition made good sense given the intensity of the ride experience, but the requirement to hand over money was much harder to stomach; it felt very much like management had decided to nickel-and-dime guests for every last cent. Despite my increasing irritation I was impressed by the standard of ride theming. The first thing we saw on entering the queue was a damaged van labelled Cyclone Hunters And Storm Enthusiasts along with half a satellite dish sticking out of the ground, its lower section defaced by graffiti. An Evacuation Route sign lay lopsided nearby. We noted two planks from the old Cyclone that had been signed by members of the American Coaster Enthusiasts during the event that had taken place in 2015, as well as a crashed plane that looked in remarkably good condition considering that its propeller was wedged into the side of a building. Various other theme elements generated a consistent effect that worked very well indeed. As we began to wait it quickly became apparent that the crew were averaging no more than one dispatch every five minutes despite two train operation. The delays were in the restraint checking process, which was done in two passes with no sense of urgency. Seat belts were being pulled taut on the first round and any closed lap bars reopened presumably so the buckles could be checked visually. Then, after a random delay, lap bars were firmly stapled to the point of discomfort, giving each guest a complimentary punch in the stomach. Oncoming riders were expected to go to the furthest available row in the station, which we didn't actually realise until we were practically screamed at by a staff member who badly needed some basic customer service training. The slow operations and randomly assigned seating were made all the more annoying by the fact that the ride was excellent. The highlight for me was the first inversion, which has been marketed as the world's first 200° stall: a left turning zero gravity roll entered from part way through a right-banked climbing turn, which felt very much like a double inversion. The rest of the layout was a wonderful blend of aggressive transitions and ejector airtime that somehow managed to remain perfectly smooth from start to end. I'd have loved the chance to try a front or a back seat, but the constant noise from televisions in the queue took its toll, and by the time we disembarked for the third time I'd had enough. It was tempting to go for a lap on Superman, a ride that I'd really enjoyed on my first visit to the park back in 2006. However, the prospect of additional queuing (or for that matter additional time in the place) did not appeal, and after a brief discussion we decided that we'd give it a miss in favour of an earlier night. On our way to the gate Megan tried to get a cup of ice water, one of the few things to be offered free of charge to guests at Six Flags parks, but the outlet she chose didn't have the right type of paper cup available (the numerous Coke-branded ones being apparently suitable only for soft drinks). The cashier generously told her that she could buy a souvenir bottle if she wanted and they'd gladly fill that, but the sixteen dollar price tag rendered that an uneconomical option.